The departure of the Mayflower, July 1620. 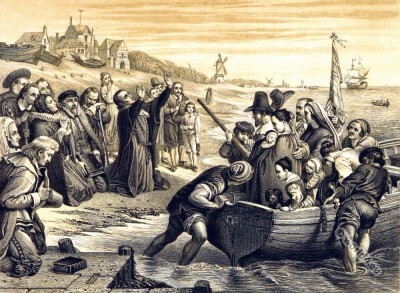 Home » The departure of the Mayflower, July 1620. Departure of the pilgrim fathers from Delft haven, July 1620. The Mayflower was a sailing vessel, with the so-called Pilgrim Fathers, many of whom were from central England, set out for America to lead a new life there. The ship was about 28 meters long, nine meters wide, and had about 4 meters draft. Aboard the Mayflower were 102 passengers and 31 crew. Captain of the ship was Christopher Jones. During the crossing, two people died and a child was born. The journey of the Mayflower is the most prominent example of the colonization of America by Europeans and is sometimes presented falsely as their beginning. The English Puritans, who had undergone severe repression and persecution in the reign of Elizabeth, had some hope of being able to obtain, under the rule of James, not only a mitigation of the penalties under which they suffered, but such concessions as would secure those reforms in the church for which they contended. To this end they presented what was called “the millenary petition,” without estimating the fact that though James had stigmatized the English Church service as an “evil said mass,” he had a decided antipathy to Presbyterian church government, and had received with favor the emissaries sent to Scotland by the arbitrary Bishop Whitgift, the great opponent of Puritanism in the reign of Elizabeth. The consequence of the petition of the Puritans was the Hampton Court Conference, in which, so far from granting anything that they asked, the king, exhibiting all his tyranny, pedantry, and buffoonery, entered at once into theological disquisition, and—to use his own words with regard to his antagonists—”peppered them soundly.” Dr. Reynolds, the chief of the Puritan advocates, and at that time reckoned the most learned man in England, pleaded in vain—though he proposed a system which approximated very closely to the form of church government which James himself had formerly endeavored to establish in Scotland. Only one great benefit arose out of the Hampton Court Congress, and that has been an incalculable blessing to the world at large. During the course of the discussion Dr. Reynolds had proposed that there should be a new translation of the Bible, and this suggestion the king caught at, and in spite of the grumbling remonstrance of Bancroft, bishop of London,eagerly closed with the proposal. In truth, though James was a pedant, and was guilty of absurdities in his common conduct, he had enough of real learning not only to superintend but to appreciate such a work, and the result was that the men appointed to make the translation were the best scholars and linguists that could be found in England. It was a happy decision also which ordered “That a translation be made of the whole Bible as consonant as can be to the original Hebrew and Greek, and this to be set out and printed without any marginal notes,” so that there was to be no sectarian interference. As Selden tells us, “The translators took an excellent way. That part of the Bible was given to him who was most excellent in such a tongue (as the Apocrypha to Andrew Downes), and then they met together, and one read the translation, the rest holding in their hands some Bible, either of the learned tongues, or French, Spanish, Italian, &c. If they found any fault they spoke, if not they read on.” The whole version was completed in 1611, and such was its recognized superiority that all the previous translations gave way to it. It even superseded the Geneva Bible, which in Scotland was the honored version, and its authority remains to this day. The Puritans gained nothing else by the meeting, and the Convocation which was held two months afterwards confirmed their worst fears. A new Book of Canons, drawn up by the intolerant Bancroft, brought forward with unsparing distinctness all the ceremonials to which especial objection had been made. It was decreed that all objectors to the Book of Common Prayer, to the Thirty-nine Articles, to the apostolical character of the Church,and to the ordination of bishops, and that all abettors of churches not belonging to the Establishment, should be accursed and excommunicated. Such severities were practised, that while it is alleged that no fewer than 1500 ministers were suspended, no better alternative remained for the oppressed than flight and exile. But by the agency of these despised and afflicted Puritans an empire as powerful as the parent country was to be founded in the untrodden wilds beyond the Atlantic. At the close of Elizabeth’s reign, when the English ports were so closely watched that the victims of persecution could obtain the privilege of banishment only at the risk of death or imprisonment, a congregation of Puritans,with their pastor, John Robinson, had effected their escape to Leyden, where, however, they found no congenial home. Though their country had cast them out, they were and would be Englishmen, and they resolved to find a land where they would still be under the dominion of their country, and where they and their posterity would still speak in the English tongue, where they could follow the modes of English life, and above all, where they and their children might worship God according to the dictates of their own consciences. Such were the Pilgrim Fathers who founded in the New World a community which, with amazing rapidity, became the nucleus of a great nation. They had been for more than ten years in Leyden, and the persecutions in England forbade their return to their own country. In 1620 the first detachment of Robinson’s congregation embarked as the pioneers of the enterprise. Only a small number of the 300 who formed that community could set out at once, because of the smallness of the vessels; and though their Dutch friends had offered not only to defray their expenses but to accompany them, they declined this generous offer, from the motive which led them to preserve their own distinct nationality. The vessels sailed first from Holland to England, but after a short stay there, the Speedwell was declared to be unserviceable, and the Mayflower alone pursued her course, with 101 passengers on board, consisting of men, women, and children. After a voyage of sixty-three days they landed at that part of the American coast on which they founded the towns of Plymouth and Boston. A huge mass of dark gray granite was the ground on which they first set foot when they landed, and before the town-hall of Plymouth it is now planted as a great national memorial of the Pilgrim Fathers, the founders of the American Republic. Sick and exhausted with the fatigues of the voyage, they fell upon their knees as soon as they had reached the shore, and gave thanks to God who had brought them in safety through storms and perils. They then proceeded to draw up the brief political constitution under which they were to live together. It would be impossible within the limits of a single article to pursue the intensely interesting account of the vicissitudes of the first colonists, the growth of the community by the arrival of other bands of refugees in the two succeeding reigns, and the internal as well as external difficulties which beset the eventual establishment of the States of Massachusetts, and Providence or Rhode Island. The reader who desires to become acquainted with the sequel to the affecting and important story of the Pilgrim Fathers would do well to refer to Mather’s History of New England and Bancroft’s History of the United States. This entry was posted in 1620, 17th Century, Baroque, England, Genre and tagged Baroque era, English history, Pictures and Royal Portraits on 6/4/15 by world4.